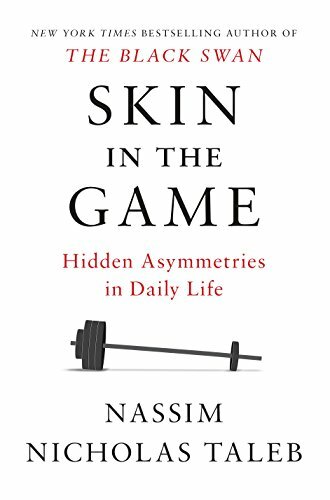 Great ideas around skin in the game and having some stake in the advice you’re getting, but I didn’t find this book as mind blowing as Antifragile or Black Swan. Still worth a read, though. Skin in the Game is about four topics in one: a) uncertainty and the reliability of knowledge (both practical and scientific, assuming there is a difference), or in less polite words bull***t detection, b) symmetry in human affairs, that is, fairness, justice, responsibility, and reciprocity, c) information sharing in transactions, and d) rationality in complex systems and in the real world. That these four cannot be disentangled is something that is obvious when one has…skin in the game. To emit a Yogiberrism, in academia there is no difference between academia and the real world; in the real world, there is. If you have the rewards, you must also get some of the risks, not let others pay the price of your mistakes. Don’t tell me what you “think,” just tell me what’s in your portfolio. The abrasions of your skin guide your learning and discovery, a mechanism of organic signaling, what the Greeks called pathemata mathemata (“guide your learning through pain,” something mothers of young children know rather well). But the worst casualty has been free markets, as the public, already prone to hating financiers, started conflating free markets and higher order forms of corruption and cronyism, when in fact it is the exact opposite: it is government, not markets, that makes these things possible by the mechanisms of bailouts. It is not just bailouts: government interference in general tends to remove skin in the game. The curse of modernity is that we are increasingly populated by a class of people who are better at explaining than understanding, or better at explaining than doing. There is no evolution without skin in the game. Rent-seeking is trying to use protective regulations or “rights” to derive income without adding anything to economic activity, not increasing the wealth of others. Effectively, there is no democracy without such an unconditional symmetry in the rights to express yourself, and the gravest threat is the slippery slope in the attempts to limit speech on grounds that some of it may hurt some people’s feelings. Such restrictions do not necessarily come from the state itself, rather from the forceful establishment of an intellectual monoculture by an overactive thought police in the media and cultural life. People’s “explanations” for what they do are just words, stories they tell themselves, not the business of proper science. What they do, on the other hand, is tangible and measurable and that’s what we should focus on. By definition, what works cannot be irrational; about every single person I know who has chronically failed in business shares that mental block, the failure to realize that if something stupid works (and makes money), it cannot be stupid. Replacing the “natural,” that is age-old, processes that have survived trillions of high-dimensional stressors with something in a “peer-reviewed” journal that may not survive replication or statistical scrutiny is neither science nor good practice. …architects today build to impress other architects, and we end up with strange—irreversible—structures that do not satisfy the well-being of their residents; it takes time and a lot of progressive tinkering for that. If you do not take risks for your opinion, you are nothing. As a Spartan mother tells her departing son: “With it or on it,” meaning either return with your shield or don’t come back alive (the custom was to carry the dead body flat on it); only cowards throw away their shields to run faster. Anything you do to optimize your work, cut some corners, or squeeze more “efficiency” out of it (and out of your life) will eventually make you dislike it. But owing to funding and current venture capital mechanisms, many people mistaken for entrepreneurs fail to have true skin in the game in the sense that their aim is to either cash out by selling the company they helped create to someone else, or “go public” by issuing shares in the stock market. We can easily identify them by their ability to write a convincing business plan. Products or companies that bear the owner’s name convey very valuable messages. They are shouting that they have something to lose. For those familiar with the idea of nonlinear effects from Antifragile, learning is rooted in repetition and convexity, meaning that the reading of a single text twice is more profitable than reading two different things once, provided of course that said text has some depth of content. Detecting that he was only invited to relieve them of the unwanted food, he forced them all to eat the turtles, thus establishing the principle that you need to eat what you feed others. You can give advice, or you can sell (by advertising the quality of the product), and the two need to be kept separate. It may not be ethically required, but the most effective, shame-free policy is maximal transparency, even transparency of intentions. There is no problem if people have a conflict of interest if it is congruous with downside risk for themselves. There is a tradeoff between laser surgery (a precise surgical procedure) and radiation therapy, which is toxic to both patient and cancer. Statistically, laser surgery may have worse five-year outcomes than radiation therapy, but the latter tends to create second tumors in the longer run and offers comparatively reduced twenty-year disease-specific survival. Given that the window used for the calculation of patient survival is five years, not twenty, the incentive is to shoot for radiation. Should you drop dead a few weeks after the visit, a low probability event, the doctor can be sued for negligence, for not having prescribed the right medicine that is temporarily believed to be useful (as in the case of statins), but that we now know has been backed up by suspicious or incomplete studies. But the pharmaceutical companies have managed to convince everyone that these unseen consequences are harmless, when the right precautionary approach is to consider the unseen as potentially harmful. In fact for most people except those that are very ill, the risks outweigh the benefits. Except that the long-term medical risks are hidden; they will play out in the long run, whereas the legal risk is immediate. Studying individual ants will almost never give us a clear indication of how the ant colony operates. For that, one needs to understand an ant colony as an ant colony, no less, no more, not a collection of ants. It suffices for an intransigent minority—a certain type of intransigent minority—with significant skin in the game (or, better, soul in the game) to reach a minutely small level, say 3 or 4 percent of the total population, for the entire population to have to submit to their preferences. Let us apply the rule to domains where it can get entertaining: An honest person will never commit criminal acts, but a criminal will readily engage in legal acts. Let us call such minority an intransigent group, and the majority a flexible one. And their relationship rests on an asymmetry in choices. Another example: do not think that the spread of automatic shifting cars is necessarily due to a majority preference; it could just be because those who can drive manual shifts can always drive automatic, but the reverse is not true. When there are few choices, McDonald’s appears to be a safe bet. It is also a safe bet in shady places with few regulars where the food variance from expectation can be consequential—I am writing these lines in the Milan train station and, as offensive as it can be to someone who spent all this money to go to Italy, McDonald’s is one of the few restaurants there. And it is packed. Shockingly, Italians are seeking refuge there from a risky meal. They may hate McDonald’s, but they certainly hate uncertainty even more. Pizza is the same story: it is a commonly accepted food, and, outside a gathering of pseudo-leftist caviar eaters, nobody will be blamed for ordering it. First, under Islamic law, if a non-Muslim man marries a Muslim woman, he needs to convert to Islam—and if either parent of a child happens to be Muslim, the child will be Muslim. Second, becoming Muslim is irreversible, as apostasy is the heaviest crime under the religion, sanctioned by the death penalty. The “persecution” of the Christians had vastly more to do with the intolerance of the Christians for the pantheon of local gods than the reverse. What we read is history written by the Christian side, not the Greco-Roman one. Another attribute of decentralization, and one that the “intellectuals” opposing an exit of Britain from the European Union (Brexit) don’t get: if one needs, say, a 3 percent threshold in a political unit for the minority rule to take its effect, and on average the stubborn minority represents 3 percent of the population, with variations around the average, then some states will be subject to the rule, but not others. If, on the other hand, we merge all states in one, then the minority rule will prevail all across. This is the reason the U.S.A. works so well. As I have been repeating to everyone who listens, we are a federation, not a republic. To use the language of Antifragile, decentralization is convex to variations. Let us conjecture that the formation of moral values in society doesn’t come from the evolution of the consensus. No, it is the most intolerant person who imposes virtue on others precisely because of that intolerance. The same can apply to civil rights. we need to be more than intolerant with some intolerant minorities. Simply, they violate the Silver Rule. It is not permissible to use “American values” or “Western principles” in treating intolerant Salafism (which denies other peoples’ right to have their own religion). The West is currently in the process of committing suicide. The market is like a large movie theater with a small door. And the best way to detect a sucker is to see if his focus is on the size of the theater rather than that of the door. Revolutions are unarguably driven by an obsessive minority. And the entire growth of society, whether economic or moral, comes from a small number of people. The underlying structure of reality matters much more than the participants, something policymakers fail to understand. Under the right market structure, a collection of idiots produces a well-functioning market. The researchers Dhananjay Gode and Shyam Sunder came to a surprising result in 1993. You populate markets with zero intelligence agents, that is buying and selling randomly, under some structure such that a proper auction process matches bids and offers in a regular way. And guess what? We get the same allocative efficiency as if market participants were intelligent. By being employees they signal a certain type of domestication. Someone who has been employed for a while is giving you strong evidence of submission. Evidence of submission is displayed by the employee’s going through years depriving himself of his personal freedom for nine hours every day, his ritualistic and punctual arrival at an office, his denying himself his own schedule, and his not having beaten up anyone on the way back home after a bad day. He is an obedient, housebroken dog. If the company man is, sort of, gone, he has been replaced by the companies person. For people are no longer owned by a company but by something worse: the idea that they need to be employable. The employable person is embedded in an industry, with fear of upsetting not just their employer, but other potential employers. In the famous tale by Ahiqar, later picked up by Aesop (then again by La Fontaine), the dog boasts to the wolf all the contraptions of comfort and luxury he has, almost prompting the wolf to enlist. Until the wolf asks the dog about his collar and is terrified when he understands its use. “Of all your meals, I want nothing.” He ran away and is still running. The question is: what would you like to be, a dog or a wolf? Whatever you do, just don’t be a dog claiming to be a wolf. people like people, and they drop business when they get some generic and polite person on the phone in place of their warm and often exuberant salesperson-friend. Those who use foul language on social networks (such as Twitter) are sending an expensive signal that they are free—and, ironically, competent. You don’t signal competence if you don’t take risks for it—there are few such low-risk strategies. Ironically the highest status, that of a free man, is usually indicated by voluntarily adopting the mores of the lowest class. The only way we have left to control suicide-terrorists would be precisely to convince them that blowing themselves up is not the worst-case scenario for them, nor the end scenario at all. Making their families and loved ones bear a financial burden—just as Germans still pay for war crimes—would immediately add consequences to their actions. The penalty needs to be properly calibrated to be a true disincentive, without imparting any sense of heroism or martyrdom to the families in question. Arguments that Trump was a failed entrepreneur, even if true, actually prop up this argument: you’d even rather have a failed real person than a successful one, as blemishes, scars, and character flaws increase the distance between a human and a ghost. Before we end, take some Fat Tony wisdom: always do more than you talk.And precede talk with action. For it will always remain that action without talk supersedes talk without action. With psychology studies replicating less than 40 percent of the time, dietary advice reversing after thirty years of dietary fat phobia, macroeconomics and financial economics (while trapped in an intricate Gargantuan patch of words) scientifically worse than astrology (this is what the reader of the Incerto has known since Fooled by Randomness), the reappointment of Bernanke (in 2010) who was less than clueless about financial risk as the Federal Reserve boss, and pharmaceutical trials replicating at best only a third of the time, people are perfectly entitled to rely on their own ancestral instincts and to listen to their grandmothers (or to Montaigne and such filtered classical knowledge), who have a better track record than these policymaking goons. While rich people believe in one tax dollar one vote, more humanistic ones in one man one vote, Monsanto in one lobbyist one vote, the IYI believes in one Ivy League degree one vote, with some equivalence for foreign elite schools and PhDs, as these are needed in the club. They are what Nietzsche called Bildungsphilisters—educated philistines. The Intellectual Yet Idiot knows at any given point in time what his words or actions are doing to his reputation. But a much easier marker: he doesn’t even deadlift. In this chapter, I will propose that what people resent—or should resent—is the person at the top who has no skin in the game, that is, because he doesn’t bear his allotted risk, he is immune to the possibility of falling from his pedestal, exiting his income or wealth bracket, and waiting in line outside the soup kitchen. For instance, only 10 percent of the wealthiest five hundred American people or dynasties were so thirty years ago; more than 60 percent on the French list are heirs and a third of the richest Europeans were the richest centuries ago. In Florence, it was just revealed that things are even worse: the same handful of families have kept the wealth for five centuries. Aristotle, in his Rhetoric, postulated that envy is something you are more likely to encounter in your own kin: lower classes are more likely to experience envy toward their cousins or the middle class than toward the very rich. The pre-Socratic thinker Periander of Corinth wrote, more than twenty-five hundred years ago: Use laws that are old but food that is fresh. Likewise, Alfonso X of Spain, nicknamed El Sabio, “the wise,” had as a maxim: Burn old logs. Drink old wine. Read old books. Keep old friends. And recall that, a free person does not need to win arguments—just win. One should give more weight to research that, while being rigorous, contradicts other peers, particularly if it entails costs and reputational harm for its author. Further, Someone with a high public presence who is controversial and takes risks for his opinion is less likely to be a bull***t vendor. The “turtles all the way down” expression expresses an infinite regress problem, as follows. The logician Bertrand Russell was once told that the world sits on turtles. “And what do these turtles stand on?” he asked. “It’s turtles all the way down,” was the answer. Simply the one who doesn’t look the part, conditional on having made a (sort of) successful career in his profession, had to have much to overcome in terms of perception. And if we are lucky enough to have people who do not look the part, it is thanks to the presence of some skin in the game, the contact with reality that filters out incompetence, as reality is blind to looks. In any type of activity or business divorced from the direct filter of skin in the game, the great majority of people know the jargon, play the part, and are intimate with the cosmetic details, but are clueless about the subject. Meanwhile, by contrast, the person who related the story went bankrupt while knowing every intimate detail about the green lumber. The fallacy is that what one may need to know in the real world does not necessarily match what one can perceive through intellect: it doesn’t mean that details are not relevant, only that those we tend (IYI-style) to believe are important can distract us from more central attributes of the price mechanism. It took medicine a long time to realize that when a patient shows up with a headache, it is much better to give him aspirin or recommend a good night’s sleep than do brain surgery, although the latter appears to be more “scientific.” But most “consultants” and others paid by the hour are not there yet. Third, we invoked the principle of simplicity, which was called antiscience. Why don’t we give these people rice and vitamins separately? After all, we don’t have genetically modified coffee that has milk with it. But we have evidence that collectively society doesn’t advance with organized education, rather the reverse: the level of (formal) education in a country is the result of wealth. The heuristic here would be to use education in reverse: hire, conditional on an equal set of skills, the person with the least label-oriented education. It means that the person had to succeed in spite of the credentialization of his competitors and overcome more serious hurdles. In addition, people who didn’t go to Harvard are easier to deal with in real life. It would fail the Lindy effect: food does better through minute variations from Sicilian grandmother to Sicilian grandmother. Further, the rich start using “experts” and “consultants.” An entire industry meant to swindle you will swindle you: financial consultants, diet advisors, exercise experts, lifestyle engineers, sleeping councilors, breathing specialists, etc. Hamburgers, to many of us, are vastly tastier than filet mignon because of the higher fat content, but people have been convinced that the latter is better because it is more expensive to produce. … most people, I am convinced, are happier in close quarters, in a real barrio-style neighborhood, where they can feel human warmth and company. But when they have big bucks they end up pressured to move into outsized, impersonal, and silent mansions, far away from neighbors. To put it another way: if wealth is giving you fewer options instead of more (and more varied) options, you’re doing it wrong. I am certain that if pizza were priced at $200, the people with corks plugged in their behinds would be lining up for it. But it is too easy to produce, so they opt for the costly, and pizza with fresh natural ingredients will be always cheaper than the complicated crap. A well-dressed man with a wiry build and neurotic personality started heaping insults at me “for stopping.” Instead of hitting him as a conversation starter, as I would have done in 1921, I pulled my cell out and took his picture while calmly calling him a “mean idiot, abusive to lost persons.” He freaked out and ran away from me, hiding his face in his hands to prevent further photographs. If we don’t understand something and it has a systemic effect, just avoid it. Models are error-prone, something I knew well with finance; most risks only appear in analyses after harm is done. As far as I know, we only have one planet. So the burden is on those who pollute—or who introduce new substances in larger than usual quantities—to show a lack of tail risk. In fact, the more uncertainty about the models, the more conservative one should be. The divergence is evident in that journos worry considerably more about the opinion of other journalists than the judgment of their readers. Compare this to a healthy system, say, that of restaurants. As we saw in Chapter 8, restaurant owners worry about the opinion of their customers, not those of other restaurant owners, which keeps them in check and prevents the business from straying collectively away from its interests. The principle of charity stipulates that you try to understand a message as if you were yourself its author. It is immoral to be in opposition to the market system and not live (somewhere in Vermont or Northwestern Afghanistan) in a hut or cave isolated from it. Kids with rich parents talk about “class privilege” at privileged colleges such as Amherst—but in one instance, one of them could not answer Dinesh D’Souza’s simple and logical suggestion: Why don’t you go to the registrar’s office and give your privileged spot to the minority student next in line? Which brings us to the principle: If your private life conflicts with your intellectual opinion, it cancels your intellectual ideas, not your private life. This is not strictly about ethics, but information. If a car salesman tries to sell you a Detroit car while driving a Honda, he is signaling that the wares he is touting may have a problem. So true virtue lies mostly in also being nice to those who are neglected by others, the less obvious cases, those people the grand charity business tends to miss. Or people who have no friends and would like someone once in while to just call them for a chat or a cup of fresh roasted Italian-style coffee. Sticking up for truth when it is unpopular is far more of a virtue, because it costs you something—your reputation. If you are a journalist and act in a way that risks ostracism, you are virtuous. But more than six hundred thousand Italians died in the Great War, during the “period of stability,” almost one order of magnitude higher than all the cumulative fatalities in the five hundred years preceding it. I am almost always confronted with “Still, there were more wars and instability.” This is the Robert Rubin trade argument, that trades that lose money infrequently are more stable, even if they end up eventually wiping you out. Reading a history book, without putting its events in perspective, offers a similar bias to reading an account of life in New York seen from an emergency room at Bellevue Hospital. I accidentally discovered the book A History of Private Life (four volumes in English) by Paul Veyne, Philippe Ariès, and Georges Duby some thirty years ago. Volume 1 (Ancient Rome) has been at a comfortable distance from my bed ever since. To summarize, in a Judeo-Christian place of worship, the focal point, where the priest stands, symbolizes skin in the game. The notion of belief without sacrifice, which is tangible proof, is new in history. The strength of a creed did not rest on “evidence” of the powers of its gods, but evidence of the skin in the game on the part of its worshippers. At no point during the emergency period did the drivers of the ambulance consider taking John Paul the Second to a chapel for a prayer, or some equivalent form of intercession with the Lord, to give the sacred first right of refusal for the treatment. while they devote less of their time to what they believe is not “religion,” many atheists engage in yoga and similar collective activities, or sit in concert halls in awe and silence (you can’t even smoke a cigar or shout buy orders on your cell phone), spending considerable time doing what to a Martian would look like similar ritualistic gestures. Let us take stock here. There are people who are atheists in actions, religious in words (most Orthodox and Catholic Christians) and others who are religious in actions, religious in words (Salafi Islamists and suicide bombers) but I know of nobody who is atheist in both actions and words, completely devoid of rituals, respect for the dead, and superstitions (say a belief in economics, or in the miraculous powers of the mighty state and its institutions). My friend Rory Sutherland claims that the real function of swimming pools is to allow the middle class to sit around in bathing suits without looking ridiculous. Same with New York restaurants: you think their mission is to feed people, but that’s not what they are about. They are in the business of overcharging you for liquor or Great Tuscan wines by the glass, yet get you in the door by serving you your low-carb (or low-something) dishes at break-even cost. Survival comes first, truth, understanding, and science later. In other words, you do not need science to survive (we’ve survived for several hundred million years or more, depending on how you define the “we”), but you must survive to do science. It is therefore my opinion that religion exists to enforce tail risk management across generations, as its binary and unconditional rules are easy to teach and enforce. We have survived in spite of tail risks; our survival cannot be that random. The only definition of rationality that I’ve found that is practically, empirically, and mathematically rigorous is the following: what is rational is that which allows for survival. Unlike modern theories by psychosophasters, it maps to the classical way of thinking. Anything that hinders one’s survival at an individual, collective, tribal, or general level is, to me, irrational. When you consider beliefs in evolutionary terms, do not look at how they compete with each other, but consider the survival of the populations that have them. Or perhaps an ecological reason: pigs compete with humans in eating the same vegetables, while cows eat what we don’t eat. Rationality does not depend on explicit verbalistic explanatory factors; it is only what aids survival, what avoids ruin. Why? Clearly as we saw in the Lindy discussion: Not everything that happens happens for a reason, but everything that survives survives for a reason. Let us call the first set ensemble probability, and the second one time probability (since the first is concerned with a collection of people and the second with a single person through time). Now, when you read material by finance professors, finance gurus, or your local bank making investment recommendations based on the long-term returns of the market, beware. Even if their forecasts were true (they aren’t), no individual can get the same returns as the market unless he has infinite pockets and no uncle points. To take stock: a situation is deemed non-ergodic when observed past probabilities do not apply to future processes. There is a “stop” somewhere, an absorbing barrier that prevents people with skin in the game from emerging from it—and to which the system will invariably tend. Let us call these situations “ruin,” as there is no reversibility away from the condition. The central problem is that if there is a possibility of ruin, cost-benefit analyses are no longer possible. Assume a collection of people play Russian roulette a single time for a million dollars—this is the central story in Fooled by Randomness. About five out of six will make money. If someone used a standard cost-benefit analysis, he would have claimed that one has an 83.33 percent chance of gains, for an “expected” average return per shot of $833,333. But if you keep playing Russian roulette, you will end up in the cemetery. Your expected return is…not computable. In my war with the Monsanto machine, the advocates of genetically modified organisms (transgenics) kept countering me with benefit analyses (which were often bogus and doctored up), not tail risk analyses for repeated exposures. Psychologists determine our “paranoia” or “risk aversion” by subjecting a person to a single experiment—then declare that humans are rationally challenged, as there is an innate tendency to “overestimate” small probabilities. They manage to believe that their subjects will never ever again take any personal tail risk! Smoking a single cigarette is extremely benign, so a cost-benefit analysis would deem it irrational to give up so much pleasure for so little risk! But it is the act of smoking that kills, at a certain number of packs per year, or tens of thousand of cigarettes—in other words, repeated serial exposure. in real life, every single bit of risk you take adds up to reduce your life expectancy. If you climb mountains and ride a motorcycle and hang around the mob and fly your own small plane and drink absinthe, and smoke cigarettes, and play parkour on Thursday night, your life expectancy is considerably reduced, although no single action will have a meaningful effect. This idea of repetition makes paranoia about some low-probability events, even that deemed “pathological,” perfectly rational. I believe that risk aversion does not exist: what we observe is, simply, a residual of ergodicity. People are, simply, trying to avoid financial suicide and take a certain attitude to tail risks. To use the ergodic framework: my death at Russian roulette is not ergodic for me but it is ergodic for the system. I have a finite shelf life, humanity should have an infinite duration. Or, I am renewable, not humanity or the ecosystem. Courage, according to the Greek ideal that Aristotle inherited from Homer (and conveyed by Solon, Pericles, and Thucydides) is never a selfish action: Courage is when you sacrifice your own well-being for the sake of the survival of a layer higher than yours. All risks are not equal. We often hear that “Ebola is causing fewer deaths than people drowning in their bathtubs,” or something of the sort, based on “evidence.” This is another class of problems that your grandmother can get, but the semi-educated cannot. Never compare a multiplicative, systemic, and fat-tailed risk to a non-multiplicative, idiosyncratic, and thin-tailed one. The Chernoff bound can be explained as follows. The probability that the number of people who drown in their bathtubs in the United States doubles next year—assuming no changes in population or bathtubs—is one per several trillions lifetimes of the universe. This cannot be said about the doubling of the number of people killed by terrorism over the same period. Just consider that: it is impossible for a billion people to sleep with Kim Kardashian (even her), but that there is a non-zero probability that a multiplicative process (a pandemic) causes such a number of Ebola deaths. One may be risk loving yet completely averse to ruin. The central asymmetry of life is: In a strategy that entails ruin, benefits never offset risks of ruin. Ruin and other changes in condition are different animals. Every single risk you take adds up to reduce your life expectancy. Rationality is avoidance of systemic ruin.